Home to art museums, major monuments, and Paris’ only skyscraper, eclectic and edgy Montparnasse is one of the city’s most interesting districts. Located in the 14th arrondissement on the Left Bank, it was famously the stomping grounds of artists and intellectuals in the 1910s and 20s, many of whom now rest in the Montparnasse Cemetery. Named after Mount Parnassus—the mountain in Greek mythology where the Muses were said to reside—Montparnasse has long had a reputation for creativity and intellectual daring. The neighborhood experienced its golden age—or its Années Folles (Crazy Years), as the period is known locally—during the 1910s and ‘20s, when internationally renowned artists and writers including Pablo Picasso, Amedeo Modigliani, Man Ray, Max Ernst, James Joyce, Ernest Hemingway, André Breton, and Marc Chagall called the neighborhood home. Today, Montparnasse is home to the Tour Montparnasse, the city’s only skyscraper; visitors also flock to the Montparnasse Cemetery, the Fondation Cartier pour l’Art Contemporain, and the Catacombs of Paris. You can take a tour of all four; alternatively, hop-on hop-off bus tours, bike tours, and walking tours provide a general neighborhood overview. 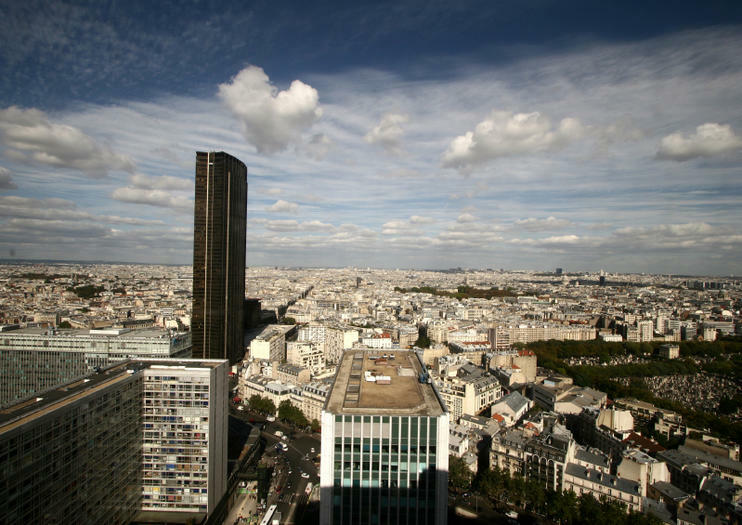 The Tour Montparnasse, which debuted in 1973, is the city’s only skyscraper, and its 56th-floor observation deck provides some of the best views in town. The Montparnasse Cemetery is the second-largest in Paris, after Père Lachaise, and contains the graves of many top artists and other creatives. The macabre Catacombs of Paris were first established in the late 18th century, and they contain the remains of more than 6 million people. The Gare Montparnasse is one of Paris’ largest and most important railway stations, and includes numerous train services, including the TGV. Additionally, the Montparnasse – Bienvenüe Métro station includes connections to the 4, 6, 12, and 13 lines. Other stations in the neighborhood include Vavin (line 4), Raspail (lines 4 and 6), Edgar Quinet (line 6), and Port-Royal (RER B). Alternatively, travel by bus or taxi, or explore on foot or by bicycle. As one of Paris’ busiest and most vibrant neighborhoods, Montparnasse is destination-worthy throughout the year. Explore sights like the Montparnasse Cemetery during the day and venture to the top of the Tour Montparnasse in the evening to savor aerial views of Paris’ neon-lit cityscape. Montparnasse’s history comes to life at the cafes and restaurants that were once favored by famous artists—La Coupole, Le Dôme, and La Closerie des Lilas are all still open today. The neighborhood is also renowned for its many Breton crêperies; don’t leave without indulging in a salted butter caramel crêpe. Gør dit besøg på Versailles virkelig specielt med en helikoptertur fra Paris. Se de mest populære attraktioner i Paris området fra luften, herunder Seinen, Bois de Boulogne og selvfølgelig Palace of Versailles. Land ikke langt fra Versailles til en drink (inkluderet) og udgør for billeder foran helikopteren. Under returen til Paris flyver du over seværdigheder som Montparnasse, Trocadéro, La Défense og få fjern udsigt over Eiffeltårnet. Vælg enten en morgen, eftermiddag eller aften afgang. Gå tilbage i tiden med denne 1920-tommers lille gruppe vandretur. Du starter din tur ved at tegne et "karakterkort", som vil tildele dig en 1920-tegnrolle at tage på. Derefter kommer du til at tilbringe tid i Montparnasse og lærer om livet og tiderne for de store kunstnere i æraen, herunder Hemmingway, Modigliani og Picasso. Din tur slutter med en drink på La Rotonde Cafe i Montparnasse, der er kendt i Hemingways "The Sun Also Rises." et unikt besøg på vores stenskårne værksted og tahitisk perle fra vores gård i Polynesien. Denne fulde-combo-tur giver dig lidt af alt og lige nok til at sige, at du har været i Paris. På en vandretur, se Ile de la Cité, Notre Dame, Justitspaladset og Place Dauphine. Efter en afslappet 3-retters frokost i Latinerkvarteret, nyd panoramaer fra 56. etage i Montparnasse-tårnet - som du indtaster med spring-the-line privilegier. Derefter træde ombord på en hop-on hop-off sightseeing bus og afslut din tid i Paris, som du ønsker. Tag en 2-timers vandretur i Paris med en privat guide for at få indblik i historie og kultur i Montparnasse-distriktet, et trendy kvarter med en rig fortid og masser af fantastisk arkitektur at beundre.